Bocce Courts at Albert Park - one of the improvements resulting from the master planning process. Albert Park, an 11.5-acre park in downtown San Rafael, California, had fallen into decline by the early 1990's such that transients colonized a five-acre portion of the park. Local residents initiated meeting with San Rafael's Director of Parks and Recreation to discuss these issues and to help the city revitalize the west side of the park. The city formed the Albert Park Renovation Committee and held public meetings facilitated and guided by the Director of Parks and Recreation to identify the range of park constituents, desired park improvements, and amenities. Committees were formed around distinct planning areas within the new park and different user or interest groups in the community adopted and maintained specific pieces of the park. Each group, in partnership with the city, planned, fund raised, and sought donations in labor and materials from within the community. The committees have proceeded on their own time schedule, guided and facilitated by the city's Parks and Recreation Department. To date, much work has been completed and use of the park has increased dramatically. Additional park improvement phases are still in the works. Albert Park is an 11.5 acre facility in downtown San Rafael that features baseball diamonds, tennis courts and an active community center. By the early 1990's, a five acre portion had been colonized by transients. In 1992, local residents initiated a series of meetings with San Rafael's Director of Parks and Recreation, Sharon McNamee to discuss these issues and offered to help the city revitalize the west side of the park. The goals were to increase activity, to create a safer setting for neighborhood use, to better integrate the park with the adjacent community center, and to enhance the existing assets in the park, including a creek area. The city formed the Albert Park Renovation Committee, which worked with city staff to identify park users and desired park amenities. The park components that were settled on in public meetings included bocce ball courts, a tot lot, a playground, volleyball, basketball, picnic areas, a patio/ porch on the recreation center, and a formal Italian garden. The city authorized a revision of the master plan for the park, and Project for Public Spaces was hired to work with residents on park layout and design. To build community involvement and to implement the plan, committees were formed around distinct planning areas within the new park, such as the bocce courts, playgrounds, and a garden. A porch committee worked to create an open porch that would connect the community center with the park. A local club called Gruppo Lonatese, after San Rafael's sister city in Italy, was raising funds to build a formal Italian garden at the back of the community center, which will include a bronze crest from their sister city, Lonate Pozzolo. Different user or interest groups in the community adopted and maintained specific pieces of the park. Each group, in partnership with the city, have planned, fund raised, and sought donations in labor and materials from within the community. The committees each have proceeded on their own time schedule, guided and facilitated by the city's Recreation Department. One resident found old photographs of the park that revealed that there were once bocce courts along the street, adjacent to what once was an Italian neighborhood. Excited to reconnect the city to its heritage, local residents became enthusiastic, formed a committee to raise support for bocce. The Marin Bocce Federation, an all volunteer non profit organization was then formed to raise money to build and run the facility. Federation members visited public bocce courts in nearby Bay Area towns and were informed by visits to bocce facilities in Italy and Switzerland by Italian community members with links to Lonate Pozzolo, where many of San Rafael's Italian residents trace their ancestry. The city approved a proposal the federation submitted, along with $50,000 seed money and $40,000 loan to begin construction. The Federation raised the rest of the $500,000 needed to complete the project from donations of money, materials, and labor. A "Buy a Brick" campaign was conducted for the patio construction (bricks were sold for $50 a piece). Many local residents, business leaders, and local clubs and organizations played a role in the success of the project. Within two years, the group has transformed an unused piece of park into six world class outdoor bocce courts surrounded by a brick patio. Carlene McCart, a parks and recreation commissioner, recalls that the proposal was attractive to the city for the following reasons: a) The plan placed the courts along the street, creating activity in the most visible site in the park; b) The group had secured sponsorship and in-kind donations before the approval. 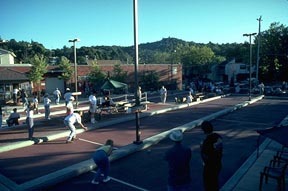 The city knew that the faster this project began, the more impact it would have on other projects being developed in the park; c) Bocce appeals to all ages and types and according to McCart, San Rafael was "hungry for an adult sport that was less physical than softball or volleyball. "; and d) The federation wanted to build top-of-the-line courts that would attract tournaments and attention to the city. The new courts attract about six hundred players each week. In the Bay Area at large, the pastime of bocce is also on the rise. There are an estimated twenty thousand players and several established leagues in the region. Bocce is a family oriented activity, one which many people can enjoy regardless of age, gender or physical condition. The court facility is managed and maintained by the Marin Bocce Federation. The Federation charges $310 per team per season (there are three seasons) to participate in the Marin Bocce Federation League. The federation also charges a small fee for court rental during open play periods. A small concession stand provides beverages and occasionally caters meals. Dolly Nave, vice president of the federation, ran the entire facility as a volunteer for the first three years it was in existence. Now the federation has hired one staffer to maintain the courts and plantings and run the league. Bocce players and their families come nightly from all over San Rafael, with wine, picnics, and barbecues. Seniors, who use the community center extensively, but rarely ventured into the park before, have organized a daytime league of their own. Local politicians and city managers hold meetings at the park and show it to outsiders. Television features, newspaper reports, and a newsletter have attracted bocce enthusiasts from all over the country as well as from Europe. Expansion of the facility to eight courts will allow for world-class tournament play. The two new courts are currently under construction summer of 1998 and the finishing touches on the court complex are underway. The formal Italian garden was completed in 1997 spearheaded by Gruppo Lonatese and facilitated by generous supervision and donations from a local contractor: Ghilotti Construction, Inc. The $200,000 project was completed quickly and boasts hand painted tiles on a new central fountain purchased by supporters as a fund raiser and a major new roadway was constructed along the north park boundary. Part of the design of the roadway was to provide a pedestrian and visual link up from A Street to the San Rafael Mission and to better connect the park to the downtown area. In 1997, a new master plan was prepared for Mahon Creek which is the southern boundary of the park. The creek will be enhanced with bike trails, improved vegetation, visual access, and serve as a pedestrian and bike link through town. The creek borders the new office complex of a major corporation and the corporation underwrote the cost of the design and extensive community input. The corporation will most likely assist with the overall construction of the creek facilities and enhancement project. Additional park improvement phases include a large elementary age children's playground, basketball and volleyball courts, as well as a patio/ porch on the south end of the Community Center. Tremendous volunteer efforts have been a significant part of the success of the bocce project, and the planning for the garden and other facilities. The community has used every connection it could muster, getting donations and support from myriad local businesses and civic groups. The city had to be extremely flexible in allowing construction to take place, since work was contracted quickly, and a great deal of authority had to be delegated to the various groups who adopted areas. Read about Albert Park as a Great Park Place.